In all my life I have never seen our Parliament in such a state of chaos. Every single proposal about leaving the EU has been rejected by the majority of MPs, not just Theresa May’s deal, but all the alternatives that were put forward last week. The only majority in the House of Commons is for not leaving without a deal, but MPs can’t agree on what the deal should be. Britain could leave in just under two weeks without a deal, but the EU may grant an extension of our remaining until the end of June or even into next year. Nobody knows and Theresa May is flying off to meet the other 27 EU governments to try and sort this out next week. I can’t walk down the street without people stopping to ask me about the chaos and what is going to happen. The other 27 European nations look on in disbelief at Parliament’s failure after nearly three years to come up with a solution. I think the cause of this problem is the fact that our democracy is the most deeply flawed of all those in the West. I was first elected to the House of Commons as MP for Brent East in 1987, and for the next 13 years until I became the Mayor of London, I served as an MP. But I couldn’t believe how dysfunctional our parliamentary system is. Most parliaments are set out in a semi-circle in which the members sit at a desk and often do paperwork while the debates drone on. But in ours, we just have five rows of seats on each side of a chamber and members aren’t allowed to do any work. Instead, they spend much of their time shouting and jeering at the MPs on the other side. The worst chaos came during regular Prime Minister’s Question Time, when the shouting and jeering meant that half the time I couldn’t hear what was being said. 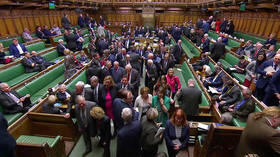 The other problem is that we have 650 MPs, but there is only space for 420 to sit on the benches, so the house is often crowded, worse than a raucous football match. All these problems go back hundreds of years. Although politicians boast that we are the oldest democracy in the world, the truth is that, back in the middle ages, power slowly seeped away from the monarch to Parliament. This was long before most people had a right to vote. One hundred and fifty years ago, they were only allowed a vote if they owned property and were male. As power shifted to Parliament, initially it was in the hands of members, but with the passage of time it was sucked up into the hands of the prime minister. Whichever party is in government, the prime minister has the power to appoint over 100 MPs into well-paid ministerial positions. This creates a climate in which the vast majority of MPs do what the prime minister wants because they want a job. As other countries became democracies, they didn’t just have a more orderly debating chamber, they all had written constitutions under the rule of law. One of the only other countries I know of that doesn’t have a written constitution is Israel. The lack of a written constitution means that prime ministers, as long as they have a working majority, can impose any changes they want and even go to war without allowing MPs to vote on whether this should happen. Another big flaw in our democracy is our electoral system, called first past the post. Most European parliaments have a form of proportional representation, so the composition of the parliament reflects how the people voted. At least twice in my lifetime a British government came to power even though their opponents had won more votes. At my first election to Parliament in 1987, the Conservatives won 42 percent of the vote, but won 375 seats. Labour won 31 percent of the vote and got 229 seats. The Lib Dem coalition won 23 percent of the vote, but only got 22 seats. This allowed Thatcher to carry on with her years of reactionary legislation, but if we had had proportional representation, she would have had just 273 seats. Labour would have had 201, and the Lib Dems 143, so there could easily have been a Labour/Lib Dem coalition governing Britain and reflecting the view of the people. Often an election is won after the constituency boundaries have been redrawn. Because most Labour voters were concentrated in poorer areas, Labour lost because they had huge majorities concentrated in their seats whilst the Tory vote was more evenly spread. This is one of the reasons why people don’t bother to vote, because they know their vote will make no difference if they live in a safe Labour or a safe Tory seat. Back in that election in 1987, only three quarters of the public bothered to vote, and in a safe Labour seat like Hackney South, just 55 percent turned out. Whereas, in the crucial three-way marginal of Brecon, the turnout reached 84 percent. So if Britain adopted a fairer electoral system, many more voters would turn out because every vote would be of equal value. At the same time, papers were filled with stories that Bernie Grant, one of the first black candidates to stand for Parliament, was a threat to our way of life. These lies and smears had quite an impact, with both Bernie and myself getting much worse results than many of our colleagues. Things got much worse when Tony Blair became leader of the Labour party. Up until that point, a local Labour party was free to choose the candidate it wanted, but Blair introduced a new rule that anyone planning to stand as Labour MP had to be vetted, and the panel he set up to do the vetting was dominated by right-wing bureaucrats who barred a vast number of left-wingers from standing. Fortunately, Blair didn’t introduce this new rule for sitting members, so people like me and Bernie Grant were able to continue, but the influx of new members in the 1997 election was the most unrepresentative in the history of the Labour party. When I was first elected to Parliament, there were many ordinary people on the Labour and the Tory side who had worked their way up through a small family business, the trade unions, or by serving on local councils. Now, 90 percent of all MPs have a university degree, and a quarter of all MPs have one from Oxford or Cambridge, two of the most elite universities in the world. If you read the diaries of former Tory prime ministers like Harold Macmillan and Ted Heath, they understand the working class because they fought side by side with them in two world wars. Now many of our MPs have had no contact with the working class except with the servants their parents employed. If we want to end the chaos in our dysfunctional democracy, we need several radical changes. Firstly, there should be a new law that ensures that each newspaper has to give fair and equal coverage to each of the parties in an election. More importantly, a fair voting system based on proportional representation should be introduced. We also need a devolution of powers from Westminster to local councils and regional government, and that would mean we would need far less MPs. Although Britain has barely a 10th of the population of India, we have almost the same number of MPs. We also need to give members of local political parties the right to deselect a sitting MP if they no longer agree with what they stand for. In America, every politician, from the president down to the mayor of the smallest town, is subject to a challenge in the run-up to each election by America’s primary system. And finally, let’s have a proper semi-circular chamber in the hope that this will reduce all the shouting and jeering.